World record progression for men's 100 m. Data, from Re. 4; dashed curve, least-squares fit of exponential function to data up to 2005; solid curve, least-squares fit of exponential function to data up to 2008. (You can see the real size image by clicking on the image). The figure and some words in my previous blog article  were cited by articles of Wired Science  and other Web sites (, for example). Considering much interest shown to the topic, I post here a sequel to the previous article. The data and the solid curve in the figure given above are the same as those in the previous article. As for another curve, description is made in the following paragraph. Following the example of the graph on a Wikipedia page , I have attached error bars to the earlier data recorded by hand timing (1912–1976). The later data were taken by electronic timing, and errors are considered to be within the size of the circle used for plotting. The curves fitted to the data pass through data points within the error bars for hand-timing days. (These were good old days!) Grids have also been drawn in the revised plot for the ease of reading off of values. Alexis Madrigal writes in his article , "Though no statistician we spoke with had recalculated their numbers, the new world record is likely to rejigger the equations they use to calculate the maximum human speed." In relation to these words, the following is to be noted: The curve in my previous figure is a "recalculated one" in the sense that all the data including the one established by Usain Bolt at the Beijing Olympic Games are taken into account in the least-squares fit. To make this clearer, I have plotted another curve (shown by dashed line) obtained by a least-sqaures fit to the data up to 2005. This curve shows an asymptotic value of (9.66 ± 0.07) seconds. The model of exponential decrease neglects the trends of small jigging of data, causing only changes in three coefficients in the equation (see Appendix 1). These coefficients are related to the height at the start of the curve, the rapidity of decrease and the asymptotic height of the curve. As was described in the previous article, the new asymptotic value of the world record was (9.43 ± 0.17) seconds. In the previous article I compared this value with the value of 9.48 seconds given by Kevin Duffy in 2002 . However, an examination of this value has shown that his curve is not the best fit to the data; using a logistic function and the data listed by him, I have obtained a better fit to the data with an asymptotic value of (9.67 ± 0.26) seconds, which is in good agreement to the value of 9.66 seconds obtained with data up to 2005. Therefore, Duffy's curve fit should be regarded as the result of insufficient search with a fortuitously low asymptotic value, and the comparison with the new asymptotic value of 9.43 seconds should be made with 9.67 or 9.66 seconds. Though all these values agree with each other within the errors of the least-squares fit (see the error bars attached to the right ends of the curves), the decrease of the central value by 0.24 or 0.23 seconds obtained in the fit to the data up to 2008 reflects the big effect produced by Usain Bolt's two latest records. The larger error in the asymptotic value of the fit to the data up to 2008 indicates that the rapid decrease of the record time brought about by Bolt defies simple curve fitting. I wrote in the previous article, "During many years, unexpected factors might come to affect the making of records, so that the result of curve fitting should not be much relied upon." The scientists whom Madrigal spoke with also said things similar to this. Namely, Peter Weyand, a physiologist at Southern Methodist University in Dallas who focuses on the biomechanics of running, said that mathematical models could never predict how fast humans might eventually run. The biomechanicist John Hutchinson of the Royal Veterinary College at the University of London, who studies how animals move, agreed with Weyand that the human speed limit would remain impossible to predict with any confidence, and mentioned as limiting factors the amount of advanced biotechnologies the International Olympic Committee and other regulatory authorities would allow sprinters to use. In the previous article I criticized Duffy's use of a logistic function, but I do not deny the use of one when the earliest data with the trend of slow decrease are available. I expect that such data will soon be posted on the Wikipedia page , because it now includes the title of a section, "Unofficial progression before the IAAF" (IAAF was the International Amateur Athletics Federation, and now is known as the International Association of Athletics Federations). 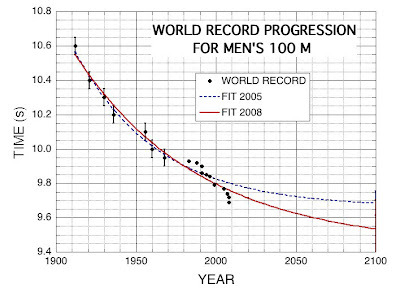 "World records for men's 100 m defy simple curve fitting," IDEA & ISAAC: Femto-Essays (18 August 2008); also in Ted's Coffeehouse (19 August 2008). A. Madrigal, "Bolt is freaky fast, but nowhere near human limits," Wired Science (25 August 2008). Fabulation, "Usain Bolt : rapide, mais pas surhumain," Geek… mais pas trop (27 August 2008). "World record progression 100 metres men," Wikipedia, The Free Encyclopedia (6 September 2008, at 05:52). Kevin Duffy, 100 m sprinting: Is there a limit? (21 September 2002; last revision, 15 January 2008). Read a similar analysis made on August 18, 2009, by taking Bolt's record of 9.58 seconds into account. c = 1.27 ± 0.36. The asymptotic value of the world record is given by (9.5 + a) seconds. The author of the blog article  wrote me, "Some friends of mine asked me why you had chose an exponential model, and not a polynomial one or another mathematical function. I answered that in physics it is very usual to see things behave in an exponential way. However, it is true that sportsmen are neither radioactive nuclei nor physical objets that are inclined to have an exponential behavior. What do you think I could answer to this particular question?" In this appendix I write my answer to this question. Sure, sportsmen are neither radioactive nuclei nor any physical object. However, the record produced by them shows the following trends: In earlier years of taking records, they can improve the record rather easily by efforts and exercise to get over the past records, the time of record exhibiting a rapid decrease. Then the stage of slow decrease comes because of limitation by mankind's bio-mechanical structure, showing the trend of approach to a limit. The simplest function to express these global trends is an exponential function with a constant term. A polynomial, for example, does not guarantee the reproduction of the trend of approach to a limit, though it can express minor jigging in data. You can read the sequel, "Bolt's World Record Changes Empirical Prediction Again" by clicking the words "a similar analysis" two lines above "Appendix 1." The URL "http..." of the link was necessary to be changed to "https...," and I've done so.